The number of Pennsylvanians accessing services for autism jumped from 20,000 in 2009 to 55,000 this year. 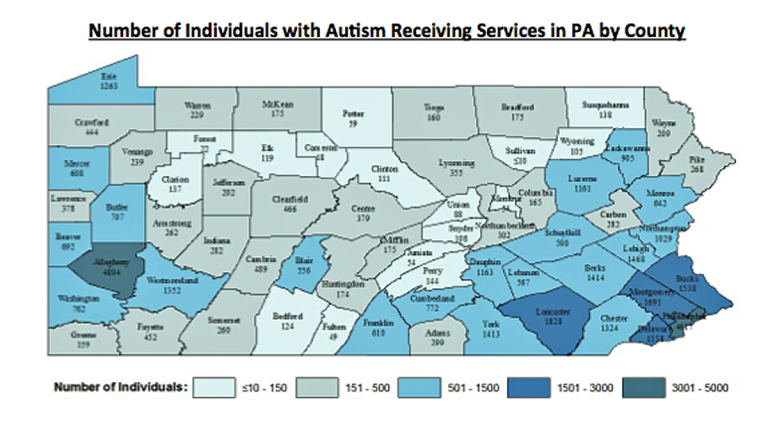 The 2014 Autism Census statistics were released this week by the Pennsylvania Department of Public Welfare and the Autism Services, Education, Resources and Training Collaborative (ASERT). The census counts those accessing publicly funded supports through the Department of Education, Department of Public Welfare, Office of Vocational Rehabilitation and the Department of Corrections, and so does not represent the total number of people living with autism spectrum disorder (ASD) in the state. The measures vary somewhat by department, but generally all people with a 299 diagnosis from the DSM count. This includes the entire autism spectrum as well as other clustered disorders. Assistant professor at Drexel and regional director with ASERT Lindsay Shea says she thinks a greater awareness of autism contributed to the uptick. The census showed an even greater jump proportionally in adults (21+) accessing services for autism – representing a 334 percent increase since the 2009 census. NewsWorks reached out to some autism self-advocates, adults living with autism who speak on behalf of the community, for comment. She says she wasn’t aware that advocating for herself was an option as a young adult. Savannah Logsdon-Breakstone also went through a difficult transition period. “I almost died about six months in of living on my own because we hadn’t identified that I needed help managing my environment ahead of time — and I became very physically sick because of it,” said Breakstone. She’s also not surprised in the jump in numbers. “We had a lot of policy and funding adjustments with the [PA] Autism Bureau that has made a lot more people have access and more funding slots available.” Breakstone says the advent of waivers for treatment, similar to those in place prior for people with intellectual disabilities, increased access and funding. Assistant Director of Adult Programs Arianna Esposito works to provide just those transitional services to young adults at St. Joseph University’s Kinney Autism Center. 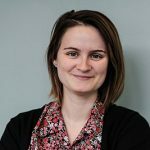 She says while educational support may not be necessary for adults, “as we get older, our social interactions become more complex.” That can impact employability and even lead to interactions with the criminal justice system as young adults with autism age out of school-based supports. But, Breakstone and Nebeker say there’s a long way to go in offering services that respond to the range of expressed needs. “A lot of people misunderstand what things people might need to live as adults in our communities. People end up being treated like children, which is not appropriate,” said Breakstone. And Nebeker remembers a time when she was unemployed for three years, but was found “overqualified” for vocational support. Both advocate for services that respond to client input and empower people with autism to live independently. The Centers for Disease Control now estimates one in 68 children fall on the autism spectrum. By that estimate, there would be an additional 130,000 people in Pennsylvania with ASD not counted by this census.